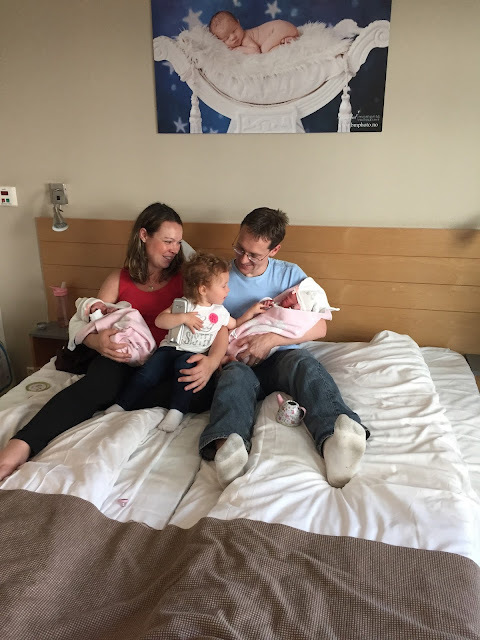 Since everything had gone so smoothly with Evelyn and Olivia's delivery, we were able to stay in the hospital hotel rather than in the hospital for the days following their birth. We stayed there with Madi as well after she was born and feel fortunate to have the resources for help following the birth. After a few hours in the hospital to recover from the delivery, we were helped over to check into the hotel. Basically the hospital has an actual hotel attached to it and the second floor is just for new mothers. The rooms are exactly like hotel rooms, but there is a nurse/midwife station with 24 hour help and support for questions, breastfeeding, etc. They come to your room at various times during your stay to check on you and to do checks on the baby (or rather babies in our case :-) ) with the pediatrician. Friday night after having dinner downstairs we were blessed with a visit from our family. My mom and Jeff brought Madi over to meet her big sisters! This Mommy sure missed her baby girl (and it had only been 1.5 days!). And somehow, I swear that child grew up in the time I missed. Her hair was longer, she seemed huge, and she was talking more adult-like. How is that even possible?! 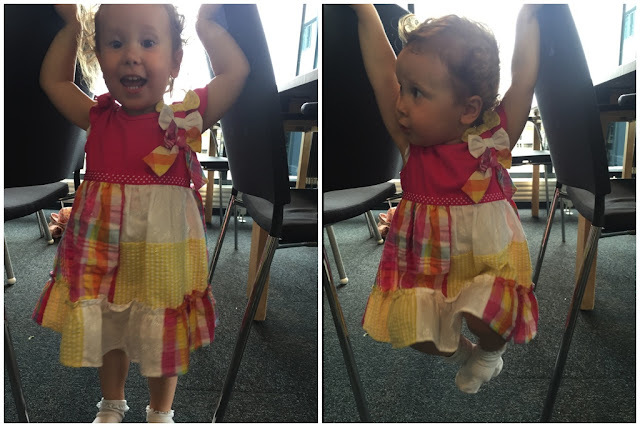 She was super excited to see Mommy and surprisingly excited to meet her baby sisters. She knew right away that they were baby sisters and asked them to give her high fives and fist bumps. Awesome. She even wanted to hold one of the babies! And then three seconds later tried to push her off of her lap. Baby steps (pun intended). 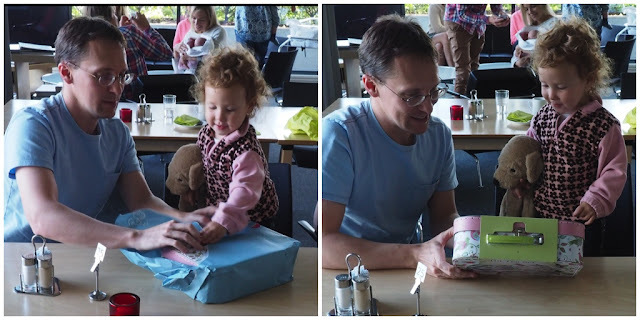 She also opened her gift from baby sisters - a tea set! Friday night went pretty well and we were able to get some decent sleep. Saturday also went well, but that evening/night was quite challenging. Both babies wanted to nurse every hour and we ended up needing to give a little formula to help since they were still hungry and my milk hadn't come in yet. Our visit with the pediatrician went well, but left us with some prayer requests. Evelyn had a slight heart murmur that they wanted to check out again Monday before we left. If it wasn't gone by then we would need to come back and have it checked once more and possibly do an ultrasound on it. The heart murmur was still there Monday so we had to go Tuesday of this week to have her checked. Fortunately it was gone and she received a clean bill of health! Olivia also needs to have some additional screenings. Since she was born breech, the hospital will schedule an ultrasound of her hips in the next 3-4 weeks to check and make sure everything is aligned properly. Additionally, during our last couple of ultrasounds when I was pregnant, the doctor noticed that one of her kidneys was slightly enlarged. She told us to mention it at the hospital so the pediatrician would recommend what to do. We were told to watch how many wet diapers she has and they will also schedule an ultrasound for her kidneys sometime in the next 3-4 weeks as well. We've had lots of wet diapers the past couple of days (especially as my milk came in) so we are hoping for good news with her kidneys and praying for no hips issues from her delivery! Sunday we got another visit from our family and a couple different members from our church. Grandma, Papa Jeff, and Madi joined us for lunch on Sunday and it was hard to say goodbye to our little duck again. But fortunately we were headed home the next day! Overall, our stay at the hospital hotel was very good. I think since we had been there before though, it made us a little stir crazy. We were ready to go home on Sunday!